Like his partner-in-unchanging-style series friend, Yoshi, Toad has managed to keep the same general outfit alive for a whopping three decades. We’re not sure if his giant mushroom topper is a physical part of his body*, but even putting potential head-spore deformities aside, this look needs some work. 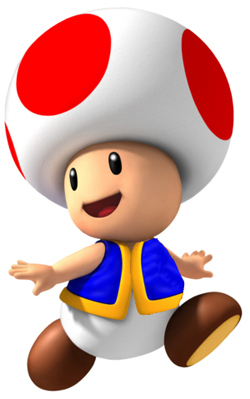 Each of our critics can select one item to dramatically improve Toad’s style, but will it be enough? 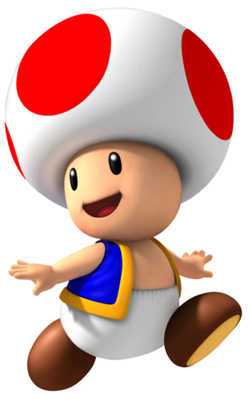 Here’s the problem: Toad is short, wearing what appears to be a diaper, and yet is supposed to be a wise advisor-type in many of his Mario game roles. I just can’t take a man dressed as a baby seriously. We need to age him up, and quick. A bushy, man’s man’s mustache is the easiest way to immediately confirm: “This is not a toddler, although it may be a 19th century villain in disguise.” Making it a ridiculously oversized and distracting mustache will hopefully also help take focus off the disaster that is Toad from the neck down. I was thinking about going on one of my patented “stupid hat” rants, but if there’s a chance that it’s a part of his body, I’d look like a total bigot for trashing on a person’s physical differences due to race. In any event, since that’s off the table, I’d like to address something else. 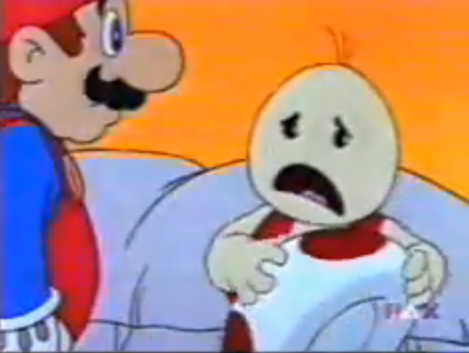 I definitely agree that Toad has always looked too much like a baby, and those baby-diaper-looking pants(?) aren’t helping. If he were to simply button up his vest, it would help counter the baby look in two ways: first, to cover up the chest and second, to cover the diaper-looking waistline on his bottoms. 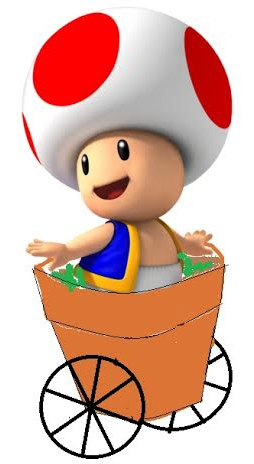 Ok, there are too many things I feel need to be done to Toad to improve his overall….whatever it is he has going on. The whole wheat dinner roll feet, the diaper, lack of shirt, his confusing mushroom hat…I would feel a lot better if we just planted him into a pot with wheels. Instant Mario Kart, no more Pampers booty, looks a little like Groot now, I like it. *Erin later discovered this image which answers the hat vs. body part question, but we’re going to pretend we never saw that so we can continue to sleep at night. This entry was posted in Character Specific, Fashion, One Item Makeover, Video Games and tagged Super Mario Series. Bookmark the permalink. How did I miss this? I think the button up vest is the best. 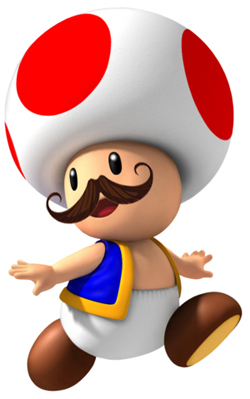 Toad with a mustache is all kinds of wrong. It makes him look old, and I always saw him as young(ish) for whatever reason. The third one… Well it just reminds me of Crisis Core’s flower wagon side quests.